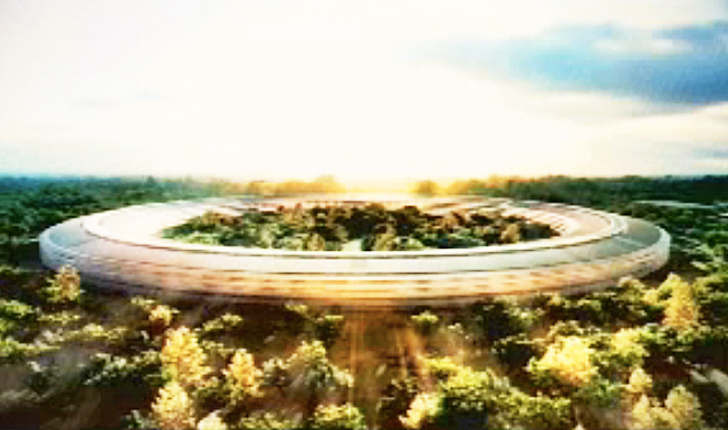 Steve Jobs made a quick visit to the Cupertino, California city council meeting on Tuesday to unveil Apple's plans for a new clean energy spaceship-shaped campus to be built in that city. Jobs and Co. has designed a spherical space that not only fits more people onto the current plot of land, but manages to create 350% more green space in the process. Apple's new headquarters, if approved, will be fueled by its own low-emissions power plant and will use grid power only in the event of an on site emergency. Watch a video of Jobs unveiling the plans after the jump. From the air, the building is quite shockingly round but from ground view, because it is so large, it slopes gently around and disappears into the planned landscape. The building will be constructed to hold 12,000 employees under one roof with some of the world’s largest panes of glass sloping around every bend. The spherical shape of the building allows for more windows than a square shaped building and therefore more ambient light, so those 12,000 employees won’t constantly be clicking on their light switches. Jobs and team plan to add 60% more trees to the landscape and have hired a top arborist from Stanford to help make sure those plants are all indigenous. The building is only four stories high and to help minimize surface parking on the space by 90% — there is a huge asphalt lot there now — the Apple team is putting most of their parking underneath the structure. As for energy for the building, Jobs said, “we deal with people sitting at computers all day writing software. If power goes out on the grid, we get to send everybody home. So we have to have backup power to power the place in the event of brown outs.” Solution, Apple plans to build their own energy center on site that will be powered by natural gas “and other clean sources” which will be their main source of power with the Cupertino grid acting as their backup system. Let’s hope those “other clean sources” make up a lot of this new spaceship campus’ power as we all know natural gas isn’t the best thing in the world. We think Apple should round out their green design by placing some shiny solar panels on their spaceship’s roof, or perhaps some tower wind turbines out in the soon to be forest. the pictures are too fuzzy to really tell what is going on. Yeah apparently the architects don't want to get embarrassed. Like novels or film directors never put ones name on your product. What's crazy about it. If you think about what Apple has done in the last ten years, or just the last two, which is revolutionize the digital environment, you have to think this will be one of the smartest structures in the USA, not to mention style-oriented and functionally outstanding. As Jobs pointed out, they've been buildling ( stores) all over the world and might have learned a thing or two. From the air, the building is quite shockingly round but from ground view, because it is so large, it slopes gently around and disappears into the planned landscape. The building will be constructed to hold 12,000 employees under one roof with some of the world's largest panes of glass sloping around every bend. The spherical shape of the building allows for more windows than a square shaped building and therefore more ambient light, so those 12,000 employees won't constantly be clicking on their light switches. Jobs and team plans to add 60% more trees to the landscape and has hired a top arborist from Stanford to help make sure those trees are all indigenous. As for energy for the building, Jobs said, "we deal with people sitting at computers all day writing software. If power goes out on the grid, we get to send everybody home. So we have to have backup power to power the place in the event of brown outs." Solution, Apple plans to build their own energy center on site that will be powered by natural gas, "and other clean sources," which will be their main source of power with the Cupertino grid acting as their backup system. We think Apple should round out their green design by placing some shiny solar panels on their spaceship's roof, or perhaps some tower wind turbines out in the soon to be forest.